It’s been only a little more than a week since the first issue of Brian Wood’s Star Wars series came and flew off the shelves. With the second printing of issue #1 expected in stores on February 6, and issue #2 (introducing Boba Fett) coming out on February 13, let’s see what people are thinking about the start of the series promoted as “This is Star Wars as you remember it . . . and as you have never seen it before” – are they fussing or are they loving it? Really, it seems to boil down to whether you like Wood’s style or not. I think everyone is pleased (or is not displeased) with the art of Carlos D’Anda. 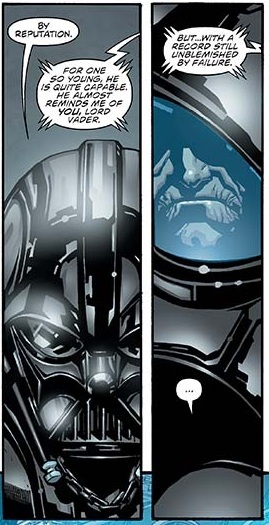 As one of the reviews points out, Brian Wood is an unusual pairing for a blockbuster title like Star Wars. While I know of his work, I’ve never really explored it, and in Star Wars, he definitely brings more introspection to the characters as opposed to action to push the plot at breakneck speeds. I can’t think of any other Star Wars titles that spend the first chunk of the story with a more somber “What’s on your mind?” “Oh, pretty much everyone I know just died and I don’t know what I’m doing.” “Same here.” That sets a tone: this is not just about lightsabers and blasters – it’s about getting into their heads. Comics Alliance says: “It just might be the most Star Wars-y comic I’ve ever read.” but needs better sound effects (for Chewie, Artoo, and Threepio). While most of the sites above are comics and general sci-fi sites, what about the Star Wars reviewers? Brian at Tosche Station goes 3/5, calling it a little “exposition heavy” and has reservations about Leia. Bryan Young and I share what we liked (Vader’s characterization) and didn’t like in it (where’s Artoo?) over at Big Shiny Robot. Good round up James, thanks for the mention. Enjoyed the comic a lot, hopeful for the direction of the title but aware there are NUMEROUS pitfalls it could fall into. As a SW and Dark Horse fan, this couldn’t have hit big at a better time. As much as I didn’t like Leia’s characterization in the comic, I just want to say I was extremely excited to see Mon Mothma in the comic. She was an underused character in the EU and it’s nice to see her in this comic taking on the full mantle of leadership. Thanks for the review roundup, James. I’m really looking forward to reading this someday soon, even if my only local comic shop sold out immediately and (for some reason they won’t explain) refuses to order copies of the second printing. Doyle: that’s a bummer they won’t order more of something that sold out. Is there another place you can try? I could probably try hitting up the local Barnes & Noble to see if they have any copies, but I’m not sure that they have a distribution deal with Dark Horse. Sadly, the comic shop that I went into is the only one for fifty miles or more in any direction. Might just see about getting it on Amazon, though I’ve never ordered a single issue from them. Next PostNext Star Wars gear at… Forever 21?